I think there's truth to this, though that doesn't mean they weren't literal events either. Genesis has a lot of deeper meanings, Noah's flood and baptism, light comes out of darkness and Jesus being the light to the dark world of sinners, Adam and Eve representing us, etc than what may meets the eye. 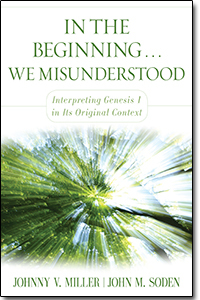 Yes, it seems to me a valid framework to interpret Genesis through. Where interpretations gets bogged down in the "trees" that can make us overlook the "forest", it gets to the theological crux of what Moses is wishing to communicate -- Israel's God is the Creator of all and as such the one true God. Compare for example, with what we know of other "gods", deities who were often the "god" of a particular kingdom or domain (Egypt's Sun god "Ra" for example). One can see how there would be much motivation for Moses to clearly define and set Israel and their God above the gods found in surrounding nations. Yes, it seems to me a valid framework to interpret Genesis through. Where interpretations gets bogged down in the "trees" that can make us overlook the "forest", it gets to the theological crux of what Moses in wishing to communicate -- Israel's God is the Creator of all and as such the one true God. Everyone interested in the issues surrounding Creationism should read this book! Looks like a good book, I'll add it to my reading. Anyone who has not read the ancient Mesopotamian and Egyptian creation accounts, should be astonished at how eerily similar they are to the Genesis accounts, yet with hugely important and stark differences about their gods, as compared to Yahweh, the God of the Bible. That can absolutely not be an accident. I got to meet and ask Miller questions, but unfortunately, it was after hearing him lecture on his book, but before I'd read it. Yes, in fact the majority of creation accounts start off with either a watery chaos, darkness, or both. The Hebrew account doesn't deny it, it just affirms God is above the other gods. A blatant example of this is how the sun moon and stars are delegated to just being guides and rulers rather than the main focus of religion. It doesn't say the sun wasn't needed for life (some interpretations say the sun was blocked by the clouds or something until then) but doesn't list it there in that account. Is the creation (or renewal) of the new heavens and earth going to be the 8th day of creation? Kurieuo wrote: Yes, it seems to me a valid framework to interpret Genesis through. Related to this I noticed a series of progression. The first day had some of the basics, light, darkness, formless earth covered with water, day 2 progresses with the sky, day 3 even more with land and plants, day 4, etc until we get to man on day 6. Man is the highest of the earthly creations, at the height of the progression. Then we come to day 7, which the 'very good' world is done being made (we know 7 symbolizes perfection) and on the new heavens and earth, a 'day 8' for the sake of argument, everything is perfect and no corruption enters ever, the last stage of perfection. thatkidakayoungguy wrote: Yes, in fact the majority of creation accounts start off with either a watery chaos, darkness, or both. The Hebrew account doesn't deny it, it just affirms God is above the other gods. A blatant example of this is how the sun moon and stars are delegated to just being guides and rulers rather than the main focus of religion. It doesn't say the sun wasn't needed for life (some interpretations say the sun was blocked by the clouds or something until then) but doesn't list it there in that account. Re: the clouds, science is laid on top of Scripture to draw out a correlation. Earlier on in Earth's history it had a translucent atmosphere -- like you would see on an overcast day, but you can still see light penetrating through. Over time, as life unfolded and and Earth developed, Earth's atmosphere changes to the clear transparent atmosphere that we see. So then, Day-Age argue that the Sun and light was created in the beginning. Primitive sea life (the Spirit of God "brooding" over the waters) and plants were created. But, it wasn't until Day 4 that the atmosphere cleared and the stars in the heavens could be clearly seen. Kurieuo wrote: Yes, it seems to me a valid framework to interpret Genesis through. Where interpretations gets bogged down in the "trees" that can make us overlook the "forest", it gets to the theological crux of what Moses is wishing to communicate -- Israel's God is the Creator of all and as such the one true God. I don't know this much about this interpretation but I would'nt mind if we had somebody here who understood this interpretation and made a case for it. Different interpretations don't bother me unless it has to do with a false gospel message but other than that I don't mind other interpretations and I don't mind discussing them and learning why people believe it.I think it helps us all to have a better understanding even if I personally disagree with it.We can handle disagreements and we should'nt let it divide us,but it often does because people elevate their interpretation to be equivalant to the gospel and it causes them to think of you as a heretic if you don't agree with their interpretation. It's not an interpretation, so much as a framework. No I don't agree the Spirit of God is supposed to mean primeval sea life. I think that started on day 3, after all for a while we thoughts germs were plants. I don't agree the "Spirit of God" means that either. Rather the "moving" over the waters, is considered by the likes of Reasons to Believe, as possibly/likely symbolising God's initial spawning of life. (Gen 1:2) I too think something is going on here. Ruach Elohim is not a breath of wind caused by God (Theodoret, etc. ), for the verb does not suit this meaning, but the creative Spirit of God, the principle of all life (Psalm 33:6; Psalm 104:30), which worked upon the formless, lifeless mass, separating, quickening, and preparing the living forms, which were called into being by the creative words that followed. רחף in the Piel is applied to the hovering and brooding of a bird over its young, to warm them, and develop their vital powers (Deuteronomy 32:11). In such a way as this the Spirit of God moved upon the deep, which had received at its creation the germs of all life, to fill them with vital energy by His breath of life.